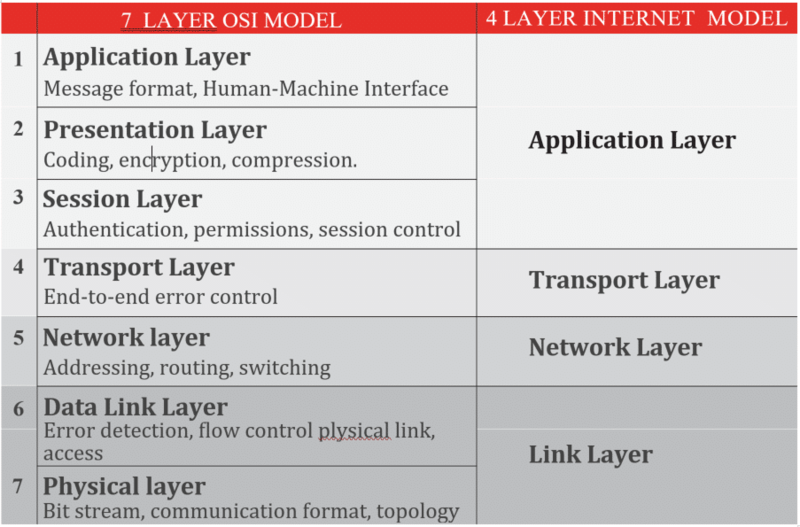 Let's break down the seven-layer OSI model traditional IoT apps use to communicate. We'll go over each layer and touch on the various IoT protocols out there. IoT systems enable Things to communicate with servers as well as other Things. As suggested by the name, the “Internet of Things”, Internet technology provides the foundation for this communication. A communication channel enables IoT system communication by combining IoT-specific Internet protocols and a method for connectivity. Here we will look at some of those Internet protocols. Existing Internet protocols, such as Transmission Control Protocol/Internet Protocol (TCP/IP), are often too inefficient and power hungry to apply to emerging IoT applications. So here, we will discuss some alternative Internet protocols developed for use by IoT systems. Before going further, it is helpful to review existing Internet layers and protocols. The Internet is based on TCP/IP communications and operates using the seven-layer OSI model shown in the following chart. This layer handles the addressing and routing of the data. This is where the Internet Protocol (IP) operates and is where an IP address originates. The traditional Internet operates on IPversion4 (IPv4), which uses 32-bit addresses. However, it is starting to evolve toward IPversion6 (IPv6), which uses 128-bit addresses to accommodate substantially more Internet addresses. At times, you may see groupings of some layers, presented as a 4-layer model. The physical and data link layers combine to form a link layer. Session, presentation, and application combine to form an application layer. Neither approach is more correct than the other. However, we will reference the four-layer model going forward. Read more about the IoT Technical Stack in the “A Reference Guide to IoT” eBook.